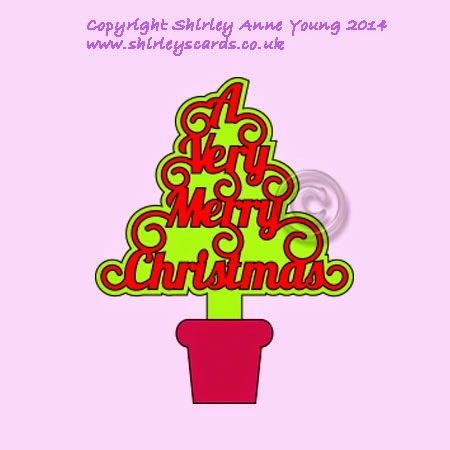 I'm still busy making all my Christmas Cards, nearly there though thank goodness. I've used this topper on some of them so thought I would share it - hope you like it. If you download the file would be nice if you could spare a moment to leave me a comment. Will make a lovely card. Thanks for all your beautiful work. Thank you Shirley for another wonderful creation. It is a lovely topper. thanks for this it will be very useful. Thank you Shirley that is gorgeous. I shall be cutting a few of these tomorrow for sure. Thank you again for sharing your amazing talent. I know everyone I give a card to will love this! Thank you Shirley, great topper, great design. Have only done 3 Xmas cards, maybe this will help LOL. Hi Shirley what a beautiful Christmas tree your topper looks lovely! A very useful topper Shirley, thank you very much. Finally got to my Email and found this lovely topper. Thanks so much..........it will come in handy! Thank you, Shirley. That is a cute tree. 'Tis a lovely card. Thank you, Shirley.